Trained Staff – Experienced and fully trained, the staff at B & M Air and Heating Inc know duct work inside and out. This critical component in your HVAC system needs to be designed for peak efficiency and installed properly for leak-free performance. Trust the advice and direction of professional technicians at B & M Air and Heating Inc to handle duct work installation and maintenance in residential and commercial buildings. Prompt Service – Ductwork plays a critical role in ventilation systems. When leaks occur you need prompt service to limit the loss and reduce damage. B & M Air and Heating Inc is ready with attentive staff and up-to-date industry knowledge, allowing for swift solutions to even the most difficult duct work issues. From the initial design stage, through to maintenance and repairs on your existing ductwork, B & M Air and Heating Inc responds quickly to your HVAC needs. Competitive Prices – Although duct work remains hidden for the most part, problems with this system can result in massive costs. Wasted energy from heating and cooling losses add up quickly. Whether for duct work installation, inspection or maintenance, B & M Air and Heating Inc offers efficient service at competitive prices, allowing you to save money on both ends. We’ve been working in the local industry since 2014 and strive to remain a price leader in professional HVAC services. 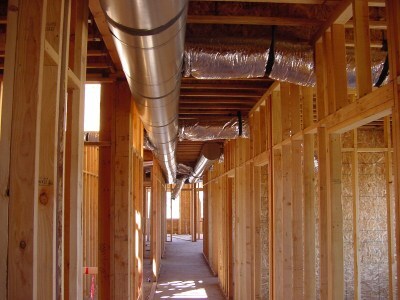 For new construction and maintenance on existing systems B & M Air and Heating Inc provides the trained technicians and prompt service your duct work systems require. Ask about our competitive prices when you call (323) 402-4203 for a quote.